Posted May 11th, 2016 by Jessica Garcia & filed under Uncategorized. 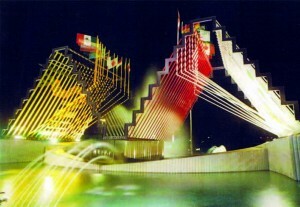 It is interesting to look back on what originally was the iconic “Ceviche” fountain that characterizes downtown Cancun and identifies us as a city. It’s interesting to see the radical transformation of what it was and how it’s changed. It all started in 1981 with the joining of the North -South Summit and the idea of commemorating the event with a monument by the New York sculptor, Lorraine Pinto. The renowned artist was inspired by the Mayan temple Xpujil and the goddess Ixchel. The cardinal points and the four elements were combined in a very particular way on a double steel structure, which changed shape as the observer shifted position. She finished it off with 22 flags representing the 22 countries attending the summit. 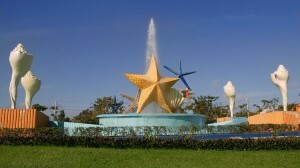 Over time, the lack of funds for maintenance made this monument gradually decay, and what nearly took the rest of it was Hurricane Gilbert in 1988; However, in 1993 Lorraine Pinto was commissioned to remodel the fountain, this time seashells and starfish were added to celebrate the 25th anniversary of the city. Even though the sculptor created the design several complications prevented from her from being present during the placement of the figures. Therefore, the four seashells were placed at the cardinal points and not spiraled to symbolize wealth and well-being. 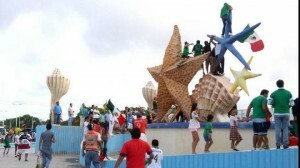 But this doesn’t prevent the seashells and starfish from captivating viewers with its genuine beauty. Affectionately called the”Ceviche” fountain by locals, it has been witness to the great changes in Cancun, from the traces of its first streets surrounded by thick jungle, to an international destination of excellence and a leader in Latin America. Written by Magally Vite. Translated by Jessica Garcia.